A lot of fashion girls, myself included, have a folder on their phone called “outfits” where they try to snap photos of their looks they want to reference or repeat again when running short on inspiration. The key word is try. Remembering to actually take the pic and add it to the folder though? Easier said than done. So, I figured I’d force myself to get serious about cataloging outfits by turning it into a story for Who What Wear. If it’s on my to-do list at work, naturally my odds of getting it done significantly increase. Two weeks of outfit snaps later, it was interesting to see what pieces I wear over and over, which color schemes I wear the most, and which silhouettes look best in photos. 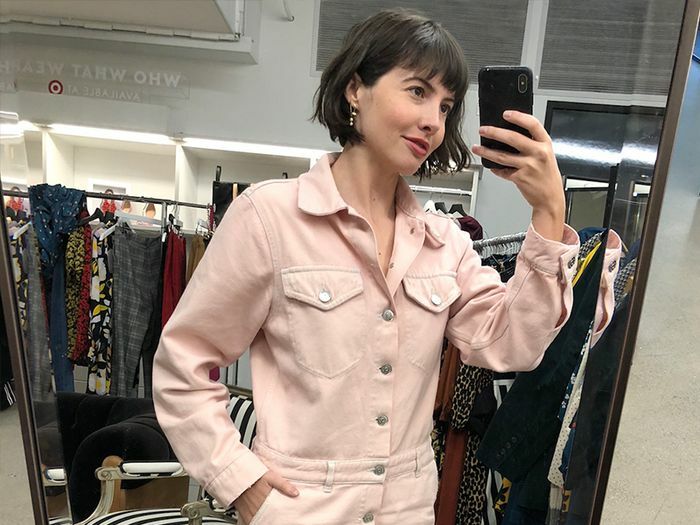 Scroll down to see my work outfits for two weeks straight, and shop the looks. This is one of my favorite outfits of the entire two weeks. As I always say, nothing says confidence like red pants and tie-dye. I don't actually say that, but maybe I should start? I can't stop wearing these jeans! They make more than one appearance in this roundup. Ganni is always ahead of the curve, and these pants are no exception. For going out at night, I love how they make an evening top feel less try-hard. My mom found this vintage cardigan for me at General Store in San Francisco. Can you believe it was only $20? I love the color. If you're looking to try the suit trend yourself this fall, I recommend two tops. A turtleneck—I love how this one has a stripe lending a sporty feel—or a zip-neck sweater. Both lend an unstuffy, yet sophisticated feel. At least on me, a button-down shirt can feel a tad office drone. Also you'll see this bag make a few appearances. It's one of my best vintage purchases in terms of cost per wear. I got it from vintage curator Lucia Zolea. There's something magical about this skirt. When I posted a picture of me wearing it to my Instagram, it quickly garnered the most likes I've ever had on an image. I'm also straight-up obsessed with this bag. The statement hardware with the croc is a heavenly combination. I attended MyDomaine's Womaneer event today, so I wanted to power dress. That meant a mismatched suit and statement jewelry. Also, stating the obvious, but I got a haircut! I got this trench coat at a store in Kyoto called Dog. I'm not sure if they still carry vintage (this jacket seemed out of place among streetwear picks), but the boutique is still worth stopping in. Also, can we talk about Nanushka? I've loved watching the Budapest brand grow by leaps and bounds each season. I'm always so impressed when contemporary brands set trends and innovate season after season. Another vintage coat! I found this one in Copenhagen. They have amazing vintage stores. Also of note, my By Far bag. The brand recently launched purses alongside its shoes, and I am thoroughly impressed. The shape is very early '00s, but somehow feels modern. I want it in every color! Lastly, I find it funny how different the length looks of this dress on the model vs. me. I'm 5'4'' for reference! Wearing: Tory Burch Reese Color-Block Silk-Satin Shirt ($350); Ganni jeans; Who What Wear Collection Love Crossbody Bag ($35); ATP Atelier Peonia Vachetta Leather Mules ($360). Colorblock has never looked cooler than this checkered Tory Burch shirt. The colors are perfect for fall, and so easy to wear. Also, don't sleep on this Who What Wear bag! It also comes with a strap if you prefer to wear it crossbody. For $35, why not? You definitely have to work in a more creative office setting to pull off this look. Note, the jumpsuit I linked to is a more vibrant pink than the one I'm wearing. The hot pink is bomb too though, and so many street style stars have been snapped in it. If you're wondering about pulling the trigger on these red heels, let me assure you they are very comfortable. 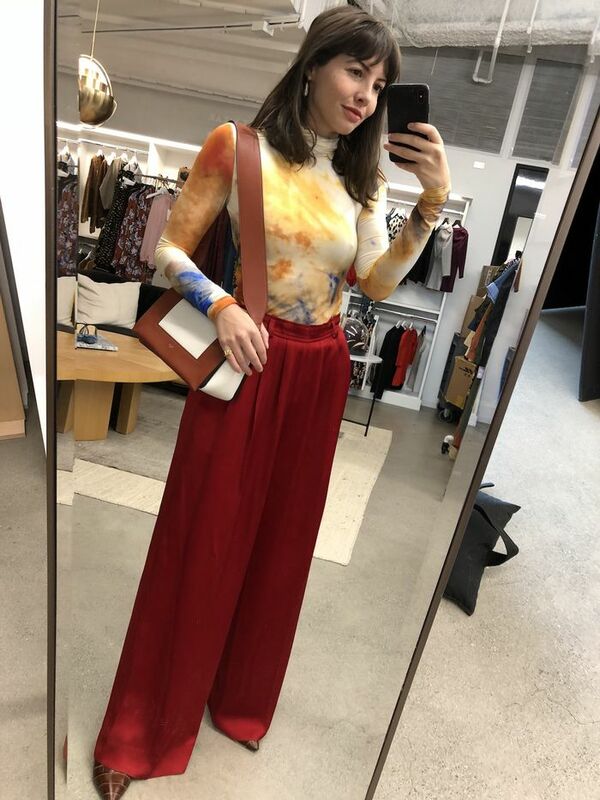 Wearing: Who What Wear Collection Long Sleeve Button Back Crew Sweater ($30); AlexaChung Tailored Crop Flare Trouser ($425); Lucy Williams x Missoma Square Malachite Necklace ($110) and Roman Arc Coin Necklace ($180); Gu_de Milky Bag ($523); Taylor + Thomas Talitha Babouche ($385). FYI: This sweater has buttons up the back and also looks fabulous worn backward. The shoes are also from a brand-new line out of Los Angeles that produces quality ethical shoes. Some of the products that went into this pair include beans and corn. Next up, check out everything I added to my closet this month. Next up, check out the 4 new it brands I test drove.